Puma cats are being conserved in Brazil in the Iguaçu National Park. I would like, if I may, to refer mainly to the report of Anne-Sophie Bertrand MSc in the FCF magazine, who is involved in the Puma Project and doing PhD research there. 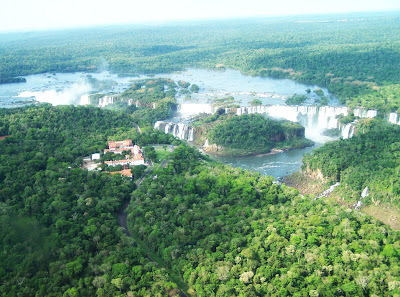 The Iguaçu National Park looks amazing. It is a very large (at 2,000 km²) "remnant" of forest in Southern Brazil and it is under federal protection. 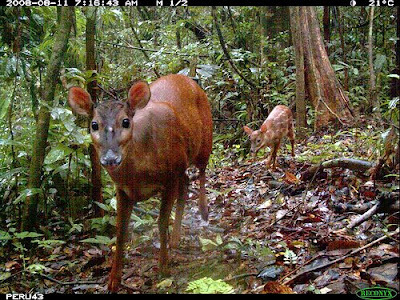 Red Brocket deer a gourmet meal for the puma in the Amazon. 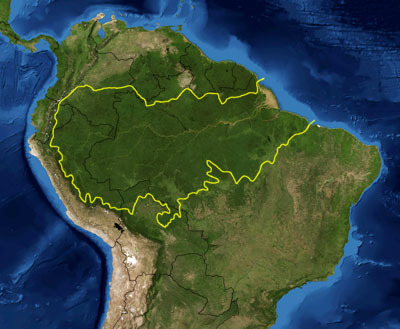 Amazon rainforest area - published under Wikimedia license. 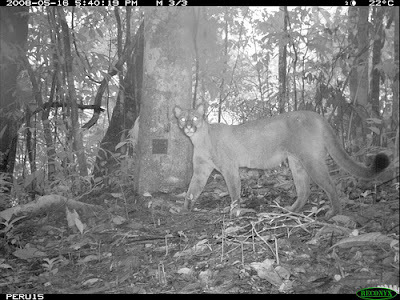 Puma is a top predator in the Amazon rainforest. The puma has a very large distribution (see map below too) as it is also found in the USA. It would seem that the greatest barrier to the conservation of puma cats in this park is the living standards of the communities who live there. The very good point made is that if the lives of the people sharing the habitat with the puma is harsh there is little reasonable prospect of them being overly concerned about much other than personal survival and any route to survival will be taken even if it is to the detriment of the wild cats and wild life generally. This thought applies to all wild animal species sharing the planet and certainly the other wild cats. I also think that it is in practice next to impossible to protect a conservation area of any reasonable size even if funding is forthcoming. This is born out by poaching of the tiger in India despite best efforts. The only certain way to preserve the dwindling population of the wild cats including puma cats is with the educated cooperation of the local people and commitment from the local and federal governments to achieve this. The former probably comes first. And in parallel sufficient knowledge needs to be gained by the experts as to the status of wild cats in the wild. There would seem to be a lot of work still to do to understand population sizes, distribution and specific threats etc. Armed with this knowledge local people can be properly informed and proper, accurate strategies formulated to conserve on a long term basis. for example in respect of the demise of the Bengal tiger). But Anne-Sophie Bertrand makes the very valid point that the best way to motivate the local people to conserve pumas is to raise the living standards of the communities and the understanding of this wild cat and collaborate with them on their terms as it is their land, their home. 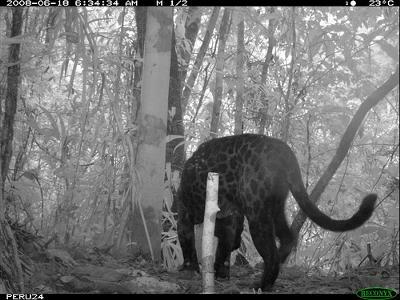 It would seem that camera traps are very valuable tools in learning about the movements and whereabouts of the wildcats. Researchers found (not unsurprisingly when you think about it) that they were being tracked by a jaguar, a rare cat that inhabits this part of the world and one of the four big cats. Sadly, what was discovered was that the most populous animal in this protected park was the human. This was also unsurprising I think. And these people are often poachers and people whose activities damage the conservation of the park generally and puma cats in particular. They also found (camera trapped) little spotted cats (the Black-footed cat), ocelots and jaguarundis. But dogs were more common than cats.